If you’re a Neil Gaiman fan, you probably saw the trailer for his latest small-screen project circulating last week. Good Omens, a novel penned as a joint effort between Neil Gaiman and Terry Pratchett published nearly three decades ago, is an apocalyptic buddy comedy about an angel and a demon that join forces to save the world from Armageddon. Gaiman penned the screenplay for the miniseries based on the novel and serves as executive producer for the project. On October 5, 2018, fans were able to get their first look at how this project will actually come to life onscreen. Aziraphale and Crowley are well cast. When the first on-set photograph of Michael Sheen as Aziraphale and David Tennant as Crowley was released more than a year ago, expectations were high. As a longtime fan of the book, I thought the duo looked perfectly cast, and seeing them in action in the trailer only confirmed my suspicions: the trailer capitalizes on the chemistry between the two talented actors. 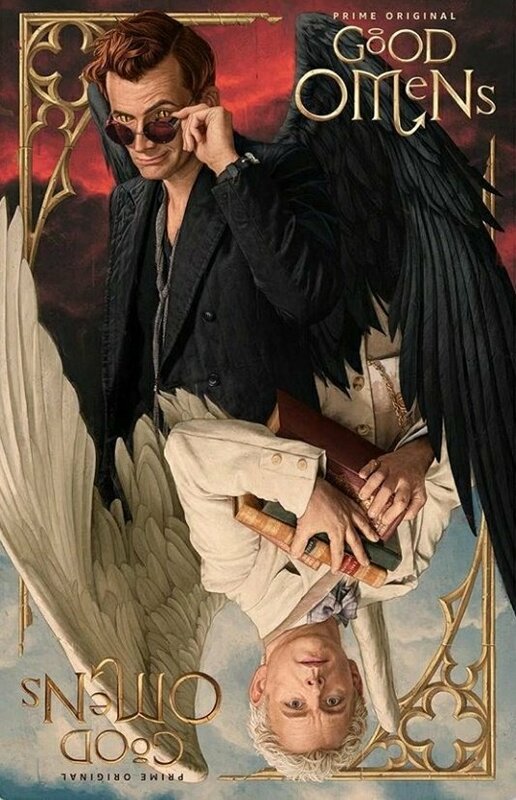 While Crowley and Aziraphale are certainly the two main characters, there are other characters (such as Adam the wayward Antichrist or the bumbling nuns who set into motion an apocalypse gone awry) who could have been featured in the first look at the miniseries. However, the trailer focuses on just these two, and rightfully so: for anyone familiar with the novel, the two actors seem well cast (I’d argue “perfectly,” but I know not everyone agrees on these things). For anyone who is not familiar with the novel, the trailer gives an excellent preview of what we can expect from its main cast. Production values are high. In the trailer, we clearly see the Garden of Eden (as well as the wastes outside), a medieval battle ground, a 17th-century witch hunt, ancient Greece, and some kind of levitating spaceship. I think it’s safe to assume that the high production quality that other Amazon projects have enjoyed (examples that immediately come to mind are The Marvelous Mrs. Maisel, The Last Tycoon, and the new Jack Ryan series) will continue with Good Omens. Considering Aziraphale and Crowley’s long history together (6,000 years, as Crowley points out at one point in the trailer), there are frequent opportunities to dazzle the viewer with period content, and from the glimpses we receive in the trailer, I think at least the first few episodes in the miniseries will have a lot of this. The project is a manageable size. Unlike Neil Gaiman’s other recent small-screen effort, American Gods, this project is being developed as a miniseries with a defined end. That means that there’s no danger of diluting the content by artificially stretching the story out to fill multiple seasons. (Side note: This is absolutely not what I feel has happened with American Gods, but that’s a piece for another day.) I believe the miniseries is an excellent medium for these types of standalone novels, as it allows the writers time to adequately flesh out the story without having to cut large portions out. Star appearances. As I mentioned above, the trailer focuses on Aziraphale and Crowley (and rightfully so), but there’s a great deal of the story that we can still eagerly anticipate. Derek Jacobi as the Metatron and Jon Hamm as Gabriel, for example, are two pieces of the production that I am looking forward to, though I suspect they will amount to slightly expanded cameos establishing the powers of Heaven that Aziraphale reports to. And speaking of powers of Heaven, Frances McDormand is credited in the role of God for the project, and I get goosebumps every time I think about that actor/role pairing. Alas, it also appears to only be for a single episode, but I’m excited nonetheless. The Antichrist. Only glimpses are shown of Adam, the oblivious and literal son of Satan, who is living a normal boy’s life in rural Britain. There is a shot of a levitating child, a spaceship following a family car (which I suspect is Adam’s doing, by manifesting his imagination into reality), and an adorably terrifying family dog with huge teeth, all of which are pieces of Adam’s storyline. We do not see his friends, who ultimately play a large part in the End Days, nor do we see much about how Adam came to be so oblivious to his ultimate destiny. The Horsemen. For a trailer about the apocalypse, notably absent were the Four Horsemen of the Apocalypse. From the production values we’ve already seen, it should be safe to say that any manifestation (modern or otherwise) of the Horsemen we see onscreen will be awesome. In my personal opinion, the trailer indicates that this production will more than do the novel justice. The casting seems spot on, what we can see of the writing is humorous and entertaining, and the production values are high. I am positively giddy with excitement to check it out as soon as it releases in 2019, and to see if it lives up to my expectations. Not to share any spoilers . . . but I think it will.